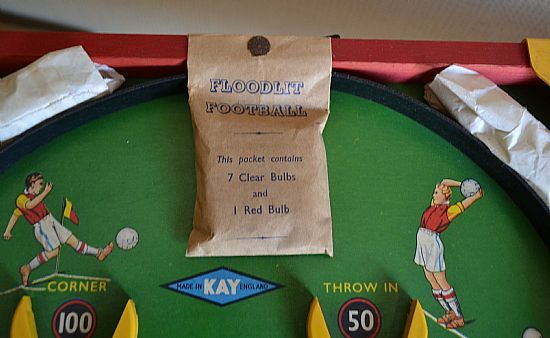 One of several different versions of the famous Kay bagatelle football games. This one being the top of the range 'electronic' version with battery and bulbs. A lovely idea that must have been quite magical in its time. 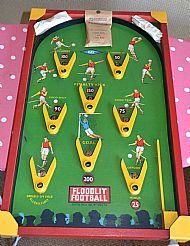 A classic bagatelle game with battery operated lights in the 'cups'. Totally unused and original game in its box. 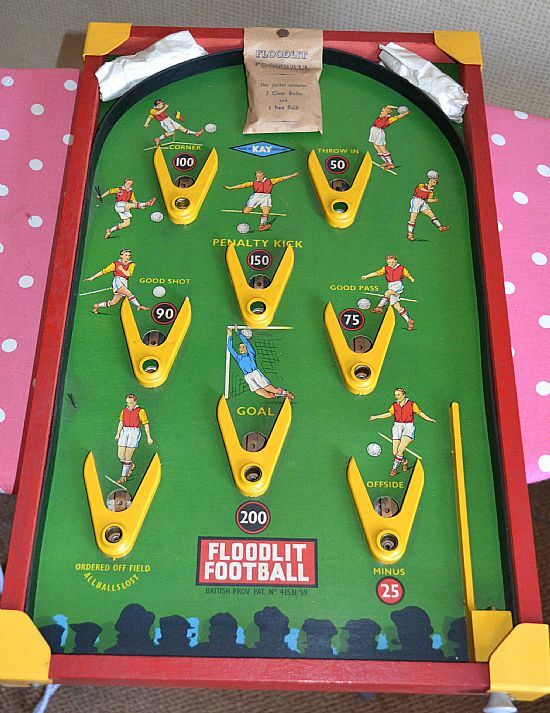 Wooden pitch with nice designs plus plastic cups and battery operated light terminals within each holder. 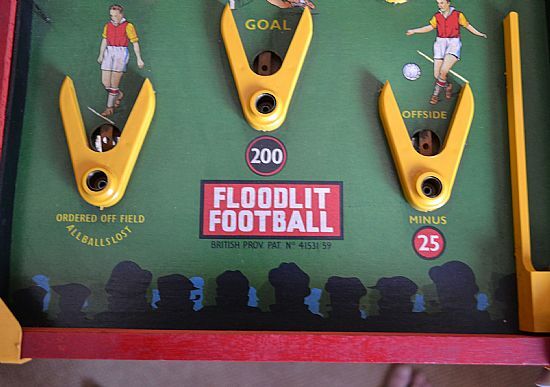 Nice to see a good old fashioned football crowd complete with caps and pipes. The bulbs are still in their sealed bag pinned to the board and the balls are in sealed bags. Do I open them and get the game working or leave as unused, ooh the dilemma!! 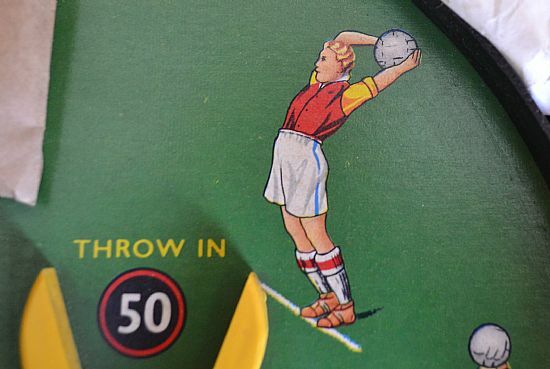 Well I always thought this game used ball bearings but here is the proof of marbles being used as the balls. 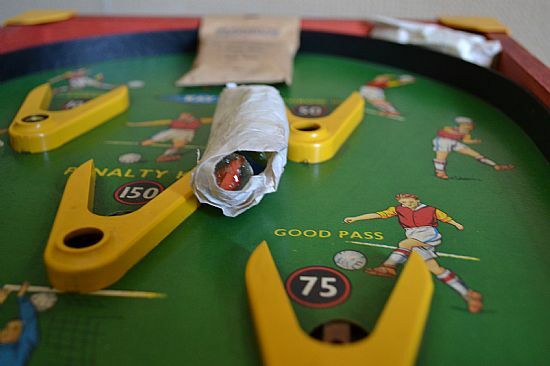 Do you recall having this game, did it have ball bearings or marbles? I guess it must have been ball bearings so the metal completed the circuit to light the bulbs - doh! Well what can we say here? man, woman, man as woman or woman as man? I think the artist probably got a bit carried away, this is no Stuart Pearce!